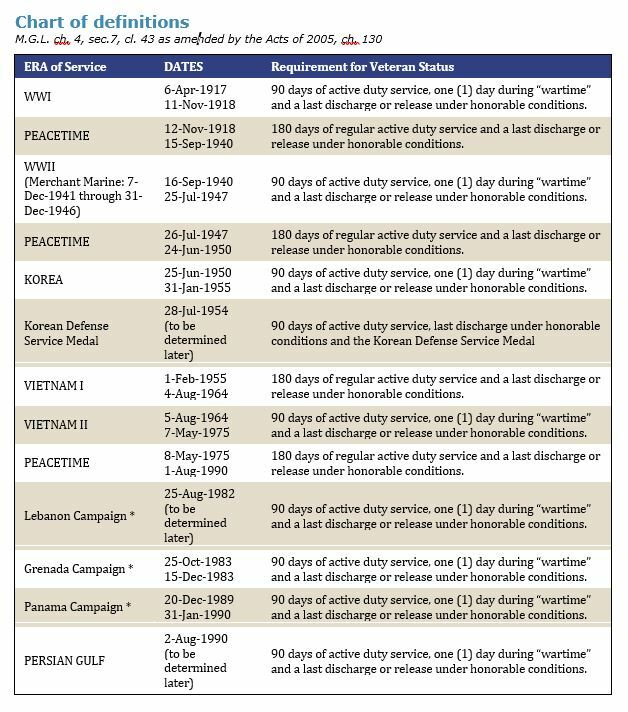 90 daysof active duty service, one day of which is during “wartime” per the chart which follows, and be discharged or released under honorable conditions, except for Vietnam I, which requires 180 days of active duty service (see chart below). Members who were activated under Title 10 or Title 32 of the U.S. Code or Massachusetts General Laws, Chapter 33, sections 38, 40, and 41 must have served 90 days, at least one of which was during wartime, per the chart located on page 3. The members’ last discharge or release must be under honorable conditions. For Reservists to qualify, they must have been called to regular active duty, at which point their eligibility can be determined by the chart below. It is not necessary that an applicant have completed the minimum service for wartime or peacetime campaign if s/he served some time in the campaign and was awarded the Purple Heart, or suffered a service-connected disability per the discharge certificate, or died in the service under honorable conditions. Active service in the armed forces, as used in this clause, shall not include active duty for training in the Army or Air National Guard or active duty for training as a Reservist in the armed forces of the United States. Any Merchant Marine who served for a period of 90 days in armed conflict between December 7, 1941 and December 31, 1946, and who received an honorable discharge from the Army, Navy, or Coast Guard of the United States. Legally adopted children of the veteran. Any person whose last discharge or release from the armed forces is dishonorable or other than honorable. * Naval and Marine DD Form 214 must indicate Expeditionary Medal. All DD Form 214's must specify campaign: Lebanon, Granada, or Panama. For RESERVISTS to qualify, they must have been called to regular active duty, at which point their eligibility can be determined by the above chart. Minimum Service Exception (for Death or Disability): It is not necessary that an applicant have completed the minimum service for wartime or peacetime campaign if s/he served some time in the campaign and was awarded the Purple Heart, or suffered a service-connected disability per the Discharge Certificate, or died in the service under honorable conditions. Training Duty Exception: Active duty service in the armed forces shall not include active duty for training in the Army or Air National Guard or active duty for training as a Reservist in the Armed Forces of the United States.